Looking to dip your toes into the social PPC waters, but aren’t sure how to get started? You’re not alone. Social PPC is similar to keyword PPC, and yet different enough to confuse those who are new to the game. Luckily, you can follow in the footsteps of those who have gone before you. Elizabeth Marsten wrote a great post for ClickZ called The Definitive Guide to Social PPC. Check it out. For tips from top PPC experts on social PPC, check out this post over at Search Engine Watch. I recently spoke at SES Atlanta about social PPC, and I wrote an article on it for Search Engine Watch. In the article, you’ll find detailed tips to succeed with social PPC. 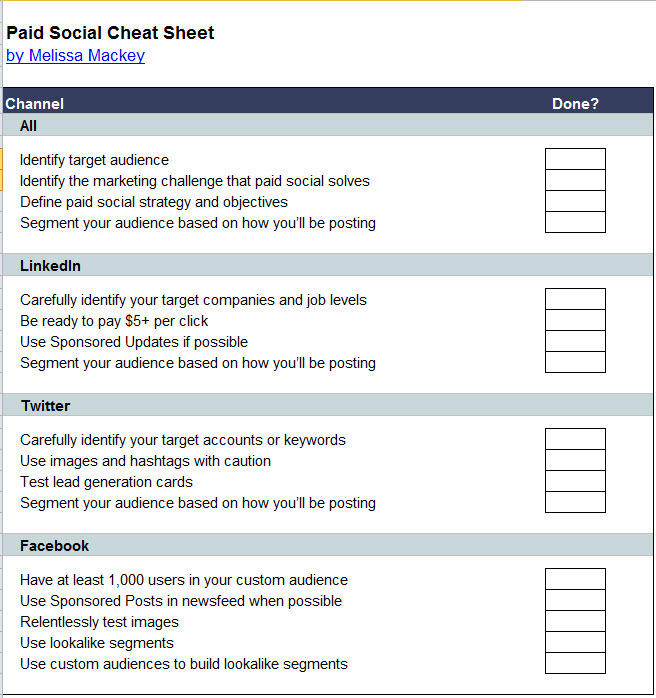 To boil it all down, I created the ultimate cheat sheet for social PPC. Too many advertisers just decide they “need a presence in Facebook Ads” or another social platform, without thinking through any strategy or keys to success. Use this cheat sheet when you’re creating the strategy for your next social PPC campaign. Thinking about these factors prior to launch will set you up for a profitable campaign, instead of a money drain. You can download the sheet in Excel, too. What are your favorite paid social tips? Share in the comments! Nice piece – one thing I would add to all of these, however, is to use Google’s url builder to make sure that you properly tag all your links – using an established structure and naming conventions (all the more important if working in a team) to ensure you can track the effects of these activities once you manage to get visitors from social across to your website. Good call, and I agree 100%. Facebook: setup the conversion pixel and the remarketing pixel. We’ve even seen better conversion ratios in remarketing on Facebook than Google for some clients. Another good call. I wish more clients were in favor of adding pixels! Sometimes it’s so hard to get things installed but it’s so worth it! As our clients are upgrading to Universal Analytics we qre taking advantage of the opportunity and asking them to implement through Google Tag Manager – once we have this in place we are then able to add 3rd party pixels – such as fb – and other scripts – we are adding our call tracking through GTM – as well as a host of other options that give valuable detail to the data.